Aikido of London announces its winter course with I Hasan Sensei 4th Dan and visiting Sensei J Nour 6th Dan Shihan in the beautiful Roman Town of St. Albans this year. With easy transportation links via road or train from London St Pancras and excellent airport access from Luton or Stansted. Classes will be at The St. Albans Judo Club Dojo which has a 2000 sq ft training area. The seminar will begin with visiting teacher Lizzie Gilchrist leading a session in Hatha Yoga. Yoga is complimentary to Aikido training for both flexibilty and posture. 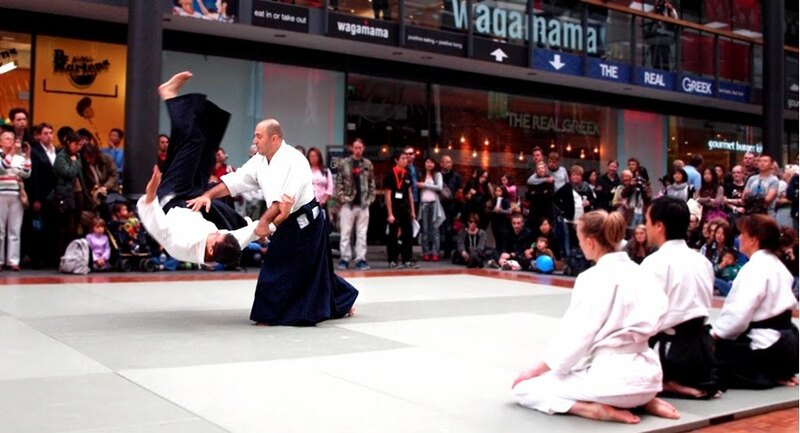 Aikido is a powerful and dynamic system of training based on traditional Japanese MartialArts. Students strive to full fill their own potential through mental and physical conditioning, as well as the training and development of technique and forms, called Kata. Developed in Japan by Morihei Ueshiba, through his committment to the martial arts he eventually formulated his own art and called it Aikido. Often described as “moving Zen” the ultimate aim is personal transformation. However,the focus of the Dojo (training hall) is practical. Repetition and hard work are required to master the fundamentals of training.